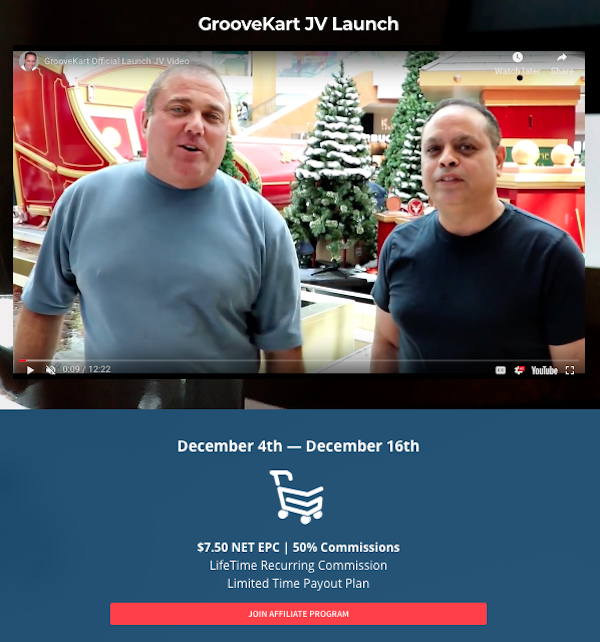 Welcome to the JVNP 2.0 Weekend Update featuring a primary JV invite courtesy of fellow JVNP 2.0 Partners Mike Filsaime + John Cornetta (Groove Kart e-Commerce platform launch affiliate program JV invite), Buzz Builders, and More … in Today’s get into the groove edition. Have a Happy & Healthy Veterans Day Weekend … Honoring All Who Served! Mark Your Calendar – December 4th – 16th (NO Pre-Launch) For The “Groove Kart Grand Opening”! Over $50K in Launch Time Prizes … a NEW CAR, Macs, TVs, CASH PRIZES & MORE! If you signed up to promote Groove Kart as an affiliate before November 5th … your links will no longer work. We’re using different Affiliate Program software, so you’ll need to create a new affiliate account if you want to promote this launch. Groove Kart is a new eCommerce platform that has been under secret development for over 2 years. Groove Kart will be better, easier, and more affordable, with more features built in standard without having to pay for expensive apps. High converting templates, timers,. scarcity, social proof, reviews, funnels, upsells, downsells, bumps, retargeting, analytics, and so much more. Import your Shopify store in seconds with the click of a button. If you’re an experienced Affiliate Marketer, we’d Love to work with you! >>> Create your NEW Groove Kart Affiliate Account to participate in this launch. Thank you, in advance, for your Support … Have an Awesome Day! JVZoo #1 Top Seller on ALL LEADERBOARDS! Earn up to $454 Per Sale During What Just May Be The Next JVZoo Million Dollar Launch! Aidan Booth + Steve Clayton, John Di Lemme, and other fellow JVNotifyPro 2.0 partners are waiting in the wings … keep your eyes on your Inbox, and follow the action in the JVNP 2.0 Premium VIP JV Announcement archives.